I've wanted to make this costume forever but have always been intimidated by it because I want it to be perfect. I've seen so many recreations of this dress but I've never seen one with the right skirt silhouette. I've been studying this costume for around 2 years now and building up my knowledge of costuming. I've finally started to come up with some good idea's on how to get the correct silhouette. The part I've been worrying about the most is the skirt. It has so full and uses a lot of material. I've been trying to figure out what sort of support is under the skirt. 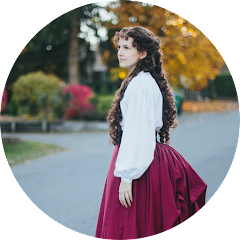 I was originally thinking of a small hoop skirt, but when you see her walking in it in the movie you can see that her legs move the fabric, so that eliminates that idea. Also, I recently realized that her skirt has a slight bustle. And in the back there is a very small portion of the skirt that lays on the ground. 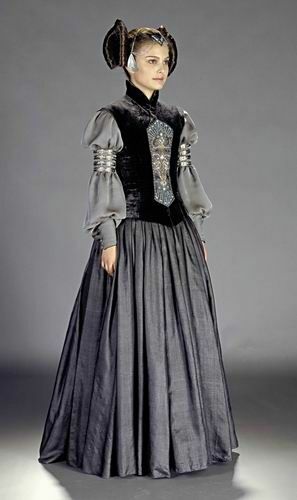 I began to think of what Trisha Biggar must have used to create this and then I remembered that one of the reasons she was chosen to be costume designer of these films was because she had a background in historical clothing. I decided to try and think of what sort of historical dresses had a similar skirt shape and came up with 1830's through 1840's and for the bustle the 1870's and 80's of course. 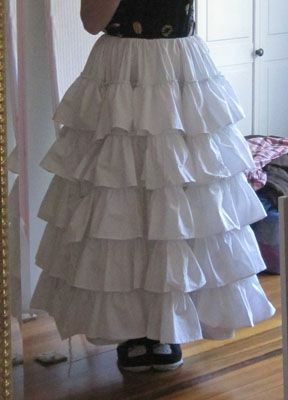 I ended up finding this ruffle petticoat made for an 1830's-40's dress that I think would give a pretty close silhouette with a few modifications. I've begun working on a mock up for both the skirt and the underskirt. I've been having to make them both simultaneously because I can't see if I'm getting the correct silhouette of the skirt without the underskirt and I can't see if the underskirt is giving the correct shape without the skirt. I've been making progress though and I'll have some upcoming posts about what I'm doing.